A dapper and stylish hat with a western flair. Reminiscent of the "wide-awake" hat that was so popular in the American West during the late 1800's. 4 inch crown with 1 inch grosgrain ribbon and 3 inch brim. 100% wool felt, unlined. USA-made. Feather is removable. Available in sizes M - XL. 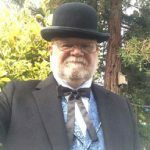 One little item and my Victorian undertaker's suit becomes an old west gambler. Fits like a glove and feels, ad looks great. Hat feels nice and looks nice. Good fit and appears to be of good construction and quality. This hat is of top quality. I tried it on and it fits comfortably on my head. I like the little feather on the side tucked into the hatband. Nice touch, The hat looks really sharp. I ordered based on sizing instructions and they were spot on. Thanks for you service and support. The gambler hat is one of the best hats I've ever purchased. It came just exactly how it appears in the picture when ordered. It's very stylish. Its a must buy. Fits perfect ! I get compliments almost every time I wear it. I already have a cowboy hat (also black, and that still fits) in the more traditional style, one that I got when in Old Albuquerque back in 1996. I love hats in general, and I wanted something of a cowboy type but a different style. Having shopped here before, I returned to check out their Western items. I immediately fell in love with this hat. It arrived insanely fast, fits perfectly, and the material construction is as excellent as the obnoxiously awesome top hat I purchased awhile back (I forget the proper name, but it’s tall and also black). I plan on ordering a leather belt/holster eventually, and I see nothing but good things there too. Indeed, everything appears to be of high quality, and my experiences up to now give me no reason to doubt that. When I contacted the website directly to let them know how much I liked my new hat and the speed with which it arrived, they responded quickly and were friendly. It’s for want of money and storage space that I don’t buy more. I highly recommend both this website and the Soft Gambler hat. You won’t be disappointed. The soft gambler hat came well-protected, and withstood its first day at the cowboy shoot with no problems. looking just as good at the end of the day as it did at the start. It's a great fit, and I look forward to wearing it to all my meets. I've worn this style of hat for many years. When my old hat became worn, I looked to Historical Emporium, because this style of hat is difficult to find and this company carries the exact look I desire. I have purchased from them in the past and have found their products to be of the highest quality. The hat arrived in perfect condition. The size was just right. Highly recommend this company especially if you are looking for a vintage style. This hat fits perfectly, and comfortably, and the material is nice quality. Looks really sharpt and great for re-enactors. My order Areived quickly and in time for Christmas! Great product, my boyfriend loves these hats. I received the hat during a hurricane watch with all the prep work need and the tear down I didn't get a chance to try it on. Now it is too late to return it. The hat is nice but, it needs to be a small which you don't carry. so $68 hanging on the wall. It was exactly w hat I was looking for. I wear it every day. Get a lot of compliments, too. The items I ordered arrived in Australia very quickly and in good condition. Sadly, I am a size halfway between the 40 and 42 so i ordered the 42 but the Trousers were too large and baggy. It is a shame because the product was excellent.